George Lucas never let us see the Empire's fun side, but that doesn't mean those guys don't like to cut loose once in a while. Sith Lord Darth Vader definitely likes to snap the occasional fun pic. 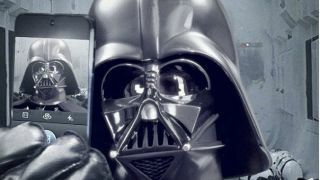 In fact, his selfie was the first picture to be uploaded onto the new Star Wars Instagram account in some early Episode VII hype-building. So now we know - it was actually Darth who shot first. Perhaps we'll have more of our Star Wars-related questions answered soon. Like, where do Stormtroopers go drinking after work? Which sector has the best parties? And does the Death Star have a canteen? Our blips are impressive. Most impressive.